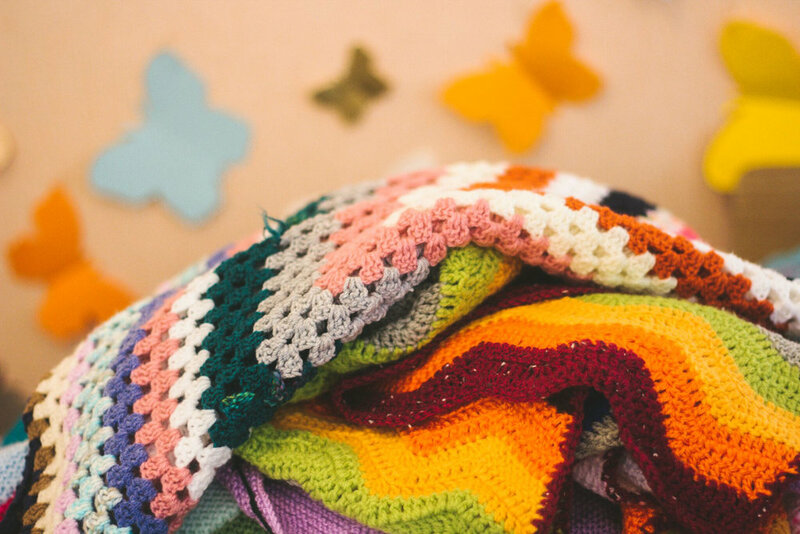 Time and time again we have had the joy of giving out beautiful brightly coloured blankets to children in Antigua, Moldova, Sierra Leone, Iraq, Ukraine and hopefully many more places to come. They are not only a gift of warmth, but also of love. Some of these children have suffered unimaginable trauma. Giving them their very own, unique blanket to snuggle in and to create a new safe place is invaluable and irreplaceable. We linked up with Loving Hands in 2011. This is a nationwide knitting, crocheting and sewing circle. Since then 100s of crafters all over the country from Shetland to Cornwall have posted in their blankets and other warm items. We even had a parcel from New Zealand! Our community of crafters share advice, patterns and chat on our Operation Orphan Crafting Facebook page. One of our team has attempted to knit a blanket (Jess will give anything a go.... once!) so we know a little about what is involved. We know that these pieces of art take huge amounts of time and skill. So we want to assure you that their value is fully appreciated by the children and families who receive them. While baby clothes are very cute, we have no outlet for these so please do not send us any items for children under the age of 3. Please make sure you include a note telling us who you are so that we can say thank you. We are happy to send a letter in the post, but if you have an email address, even better! Please don't panic if you don't hear from us straight away it can take a couple of months to go through the parcels. But please know that we are very grateful for everything you send us. Finally, if you have friends that don't knit or crochet but would like to help, financial contributions towards our transportation costs are always very gratefully received.